The world watches the unfolding drama as the man who has become the symbol for Palestinian nationalism seems to hover between life and death. 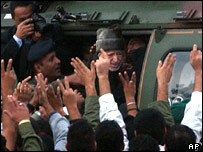 Though full of uncertainties, Mr Arafat's life has been one of sheer dedication and resilience. To be honest, the coverage of Yasser Arafat's illness and departure from Palestine was a real grind. I churned out one report after the other, without any sense of drama. Foreign journalists seemed much more excited about Mr Arafat's fate than anyone in Ramallah. We hovered around the gate to his compound, swarming around the Palestinian officials who drove by, poking our microphones through their dark, half-open windows. But where were the people, I wondered, the mass demonstrations of solidarity, the frantic expressions of concern? Was this another story we Western journalists were getting wrong, bombarding the world with news of what we think is an historic event, while the locals get on with their lives? Yet when the helicopter carrying the frail old man rose above his ruined compound, I started to cry... without warning. In quieter moments since I have asked myself, why the sudden surge of emotion? I suppose there was a pathos about the strong contrast between this and other journeys Yasser Arafat has made. There was his defiant departure from Lebanon in 1982 after the Israeli army had routed his Palestine Liberation Organisation. He promised then he was on his way to Palestine, and, in a roundabout way, he was. There was his triumphant return to the Gaza Strip in 1994, when the Oslo Peace Accords appeared to open the window to a Palestinian state. Tens of thousands of people cheered his arrival; they were even hanging from the trees! Compare that to the few hundred loyalists who came out to watch him leave the West Bank on Friday, waving and calling out one of his favourite sayings: the mountain cannot be shaken by the wind. But I think this history explains Palestinian emotions better than mine. For me, it was probably the siege. 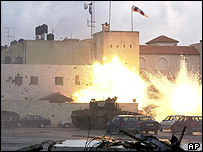 I remember well when the Israelis re-conquered the West Bank more than two years ago, how they drove their tanks and bulldozers into Mr Arafat's headquarters, trapping him in a few rooms, and throwing a military curtain around Ramallah. I remember how Palestinians admired his refusal to flee under fire. They told me: "Our leader is sharing our pain, we are all under the same siege." Maybe that gives me some connection to the man whose presidential compound became a prison. I know what it is like to stare at the same four walls and find them staring back; to watch tanks swing their turrets outside my window; to scan rooftops for snipers during brief hours of freedom between curfews. I could understand why Palestinians responded to Mr Arafat then the way they did. Despite his obvious failings - his use of corruption, his ambivalence towards violence, his autocratic way of ruling - no one could accuse him of cowardice. During those black days in Ramallah, he was a symbol of Palestinian unity, steadfastness, and resistance. Since then he has languished in the twilight of world indifference to his plight. So I was a bit surprised at how quickly the world sprang to his aid; one of the indications to me that his condition was indeed serious. Take the Arabs for instance. After essentially ignoring Mr Arafat's captivity, Arab countries sent a team of doctors to keep the Palestinian symbol on life-support, a fitting example of what his people have always criticised about the widely vaunted Arab solidarity with their cause. The Arabs, they say, are always ready with gestures and fiery rhetoric, but always abandoning them when help is most needed. They diagnose the disease, say Palestinians, but do nothing to cure it. And the Israeli Prime Minister, Ariel Sharon, suddenly facilitating Mr Arafat's speedy exit from the country and promising he could return. Before he had always suggested the Palestinian leader would be exiled if he left the West Bank. We spent one hectic afternoon reporting this about-face, explaining that Mr Sharon was ready now to show humanitarian consideration to the man he has demonised, humiliated and on several occasions, openly wished dead. 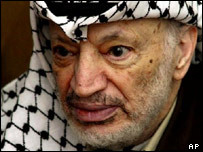 Everyone says Yasser Arafat has made too many mistakes, that he has missed too many opportunities. He did and he has, but look also at what he has been up against. Throughout his years of revolution, peace, and uprising, the Palestinian leader has been an enduring national symbol. But as he boarded the helicopter with faltering steps, he also stood for something else: for a people exhausted by war, bereft of hope, abandoned by their brothers, and fearful of the future. Perhaps that is why so few Palestinians saw him off. In him, still, they see themselves. From Our Own Correspondent was broadcast on Saturday, 30 October 2004 at 1130 BST on BBC Radio 4. Please check the programme schedules for World Service transmission times. Note: BBC Governors upheld part of a complaint about this report. See link below.